Hoover Dam, once known as Boulder Dam, is a concrete arch-gravity dam in the Black Canyon of the Colorado River, on the border between the US states of Arizona and Nevada. It was constructed between 1931 and 1936 during the Great Depression, and was dedicated on September 30, 1935, by President Franklin Roosevelt. Its construction was the result of a massive effort involving thousands of workers, and cost over one hundred lives. Hoover Dam impounds Lake Mead, and is located near Boulder City, Nevada, a municipality originally constructed for workers on the construction project, about 25 mi (40 km) southeast of Las Vegas, Nevada. 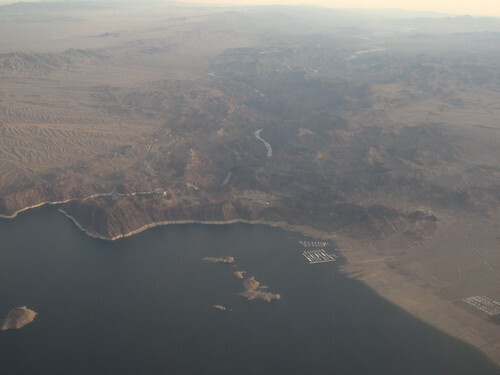 The dam's generators provide power for public and private utilities in Nevada, Arizona, and California. Hoover Dam is a major tourist attraction; nearly a million people tour the dam each year. Heavily travelled U.S. 93 ran along the dam's crest until October 2010, when the Hoover Dam Bypass opened.